Due diligence is about doing your homework. Your goal is for negotiators to learn about and analyse important components of each other’s organisation in order to decide whether to proceed with the merger or not. Robust due diligence requires you to share everything from financial information, to organisational structure, to the results of evaluations for specific programs – whatever each party considers relevant to their decision to proceed with a merger. It is an opportunity to learn about your potential merger partner, but also to build close relationships through sharing information. The process should begin once the negotiation group is established and commonly takes 6 to 12 months. Due diligence is about more than simply following a checklist. It poses a significant communication challenge, both within your organisation and between organisations. Internal communication during due diligence should be as transparent about the process as possible. It should be clearly communicated that during this phase the details of the merger are yet to be settled. Commonly, the work of due diligence is limited to a small group of individuals tasked with collating the relevant documents, while the rest of the organisation continues relatively uninterrupted. However, staff have a significant stake in the outcome of the merger and will be seeking information. Clear and honest communication avoids the risk of unnecessarily unhappy staff. Meeting the legal requirements of the due diligence process will increase the workload of your management staff, which can be difficult in a resource constrained environment. As a result, and without external help, sometimes NFPs are forced to ‘cut corners’. This can result in haphazard information sharing, or sharing of information after the point when it would influence an important decision. These lapses risk ‘surprising’ your merger partner later in the process and can become significant obstacles to a merger. Examples of ‘surprises’ include: an overdue loan repayment, missing contract documentation or undisclosed tax liabilities (see Identify potential ‘show stoppers’). During due diligence, continue meetings of the negotiation group to strengthen relationships between your organisations. Strong relationships are important in the context of sensitive discussions around the strengths and weaknesses of each party. Questions about financial information generally require the most work due to fears of hidden liabilities, so preparing the relevant financial information should be a priority. Examples of these questions are provided in Figure 8. However, there is some scope to prioritise which documents are shared to help align the due diligence process with negotiations. For example, checking the authority and approval process for the merger at this stage will save time later in the process. Recognise that this prioritisation of certain information transfers over others is often very difficult, as each merger partner is likely to have its own special areas in which it wants more information about its peer. Due diligence is a process that can be effectively facilitated by external specialists, or by internal staff with the right expertise. Without independent review of findings the chance of missing red flags is significantly increased. Independent external experts that can assist the process are usually lawyers, accountants or management consultants. Whether the due diligence work is done internally or externally, the analysis should be either reviewed or conducted by someone who is not a member of staff with a vested interest in the process – e.g. by a Board member, a committee of the Board or an external party. 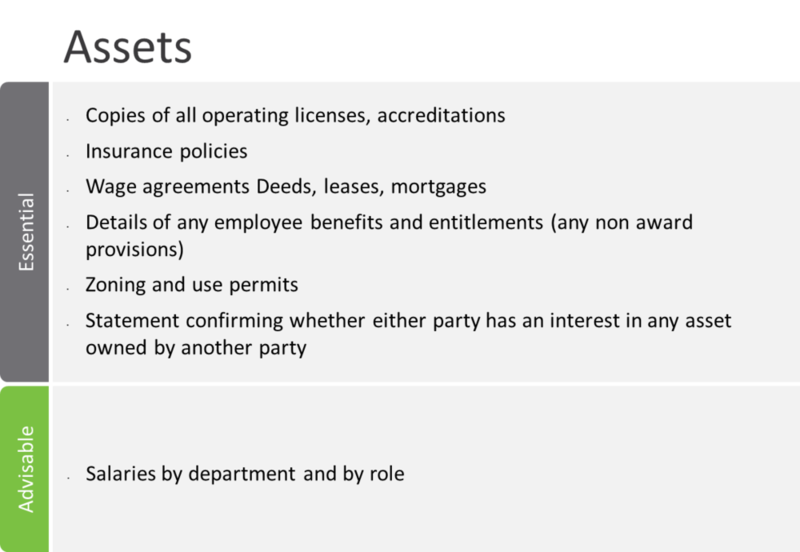 Key considerations of conducting due diligence internally or externally are outlined in Figure 9. In light of new information from the due diligence process, deciding whether or not to pursue a merger is difficult. Discovering a red flag may prompt a ‘go / no-go’ discussion. The discussion should be framed around whether the merger could still be successful in light of this new information. Once you have grappled with these difficult questions, the remaining due diligence should focus on the relatively straight-forward process of deciding upon the relevant documents necessary to transfer, transferring them, and evaluating their importance to the decision to merge. To aid this deliberation, below is a selection of common due diligence items categorised by their function and importance. It is important to remember that due diligence generally only captures measures of private benefit. In a not-for-profit context where public benefits are often the raison d'être, this misses an important part of the picture. For example, an underfunded but effective youth outreach program may be a financially unsustainable, but incredibly valuable to a not-for-profit organisation whose mission aligns with the program’s objectives and intended outcomes.